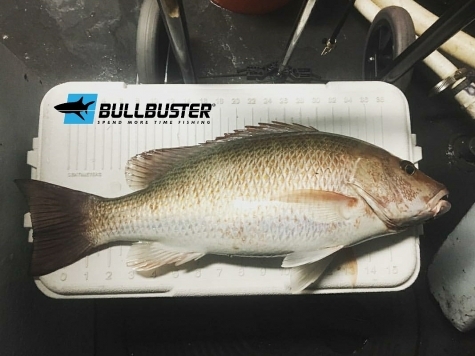 Bullbuster In Action: Bullbuster Mono Gets The Fish In The Boat When Sharks Are Feeding. Bullbuster Mono holds up under pressure! On a night that started off well, we found parking directly next to the boat right away, we put Bullbuster Monofilament to the test. Capt. Ryan and Mate Bernie set up the boat as we wait in anticipation of another great snapper trip. The boat filled up quick as it was a Friday night, boat leaves at 8, and we were lucky to have called in and reserved 2 spots. Usually you can walk up and hop on but some days the boat fills up quickly and you are better off calling ahead of time to make sure you get a spot on the boat. I looked around and saw Leaders made of Bullbuster mono 30 lb and 3/0 Circle Hooks, I occasionally take my own Bullbuster Fluorocarbon with me but today I went with the supplied leader and hook. I quickly grabbed my rod started setting up for some bottom fishing, a 1/2 ounce egg, plastic bead, barrel swivel, 2 Foot Leader and a 3/0 Circle hook, needless to say we were ready for some big Mangrove Snapper.